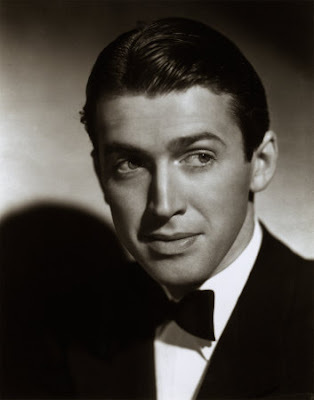 I am in love with Jimmy Stewart. Never mind that he is no longer here on earth, or the fact that if he were he would be 100 years old as of today, I still love him and always will. It isn't just the fact that he stared in some of my all time favorite movies, such as Rear Window, Harvey, Vertigo, The Glen Miller Story, The Man Who Knew Too Much, It's A Wonderful Life, and Mr. Smith Goes To Washington, it's more then that. I love Jimmy Stewart because of what he represents. Goodness, honesty, strength, imagination, aspiration, loyalty, compassion, humor and passion. These traits were often present in the roles he played, and I think the reason that he was so convincing playing these types of parts was because he truly embodied the same traits. It wasn't an act. He was the real deal. So Happy Birthday Mr. Stewart. Thank you for leaving such a body of magnificent work and for setting such a humbling example of what a person can be. I found this video of Jimmy Stewart on the Johnny Carson Show, where he is reading a heartfelt and touching poem which he wrote in loving memory of his dog Beau. It makes me cry. Such a sweet man. To me, he's also quintessentially American. How can you not just love that man? Thank you for sharing this today and Happy Birthday Jimmy! Happy birthday Jimmy! I love this guy! My boy and my first movie together was It's a Wonderful Life! We could use some Jimmy Stewart types in times like these...Hollywood would be so much better off. Lovely tribute! Oh my, I came across your blog via a google hand-embroidery alert and found your tribute to Jimmy Stewart. You said it all, he is my favorite too, and has been as long as I can remember. It's A Wonderful Life has been my favorite movie since I first saw it many moons ago. Thanks for sharing your thoughts and birthday wishes for Jimmy. I have never heard of a Google alert before, thanks for the new info!